"Ghulam the Singer," said Subhana, "one of the lyrical Persian poets, in the court of the Emperor Jahangir, though himself a Kashmiri, knew of this rare wool and mentions it in his love poem entitled Love,' which I consider one of his finest pieces:"
Her equal is not anywhere! Her cheeks as soft as ibex wool." "The poem," added Subhana, "narrates the story of the princess, for she was a princess, being sent by her father, the ruler of Badackshan, because of jealousy in the court, to be raised by a hermit in the eastern hills. But a spirit of evil, in form a vulture, or griffin, steals her and carries her off to his infamous nest or castle on the highest peak. The griffin's domain is guarded by the nagas, or snake people. The hero of the poem, a shepherd of goats, who turns out to be the son of the Shah of Ghazni, is determined to rescue the imprisoned princess. He obtains the help of the Hindu god Hanumon, lord of the monkey people. In this way the poem skillfully merges the myths of the Persians and the Hindus in one of the most touching love stories of all times and all countries." ~ An extract from THE WORST by Arthur A. Baer for The Chicago Literary Club. April 18, 1960. [Read the complete piece here]. It's about the art of Kashmmiri salesmanship as practiced by one of its greatest practitioners. Talks on history, poetry, religion and politics while dealing in old rugs. All inside the store of Subhana the Worst that first opened in 1840 just as tourists started coming into the valley. There's a video too (but no sound). And here's an old international news report (Pittsburgh Post-Gazette - Oct 20, 1965) about the store run by M. Subhana Kachroo, the fifth generation of the original Subhana who started the store. 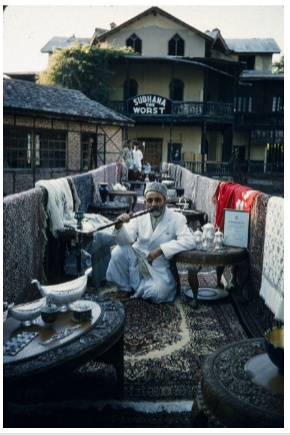 SRINAGAR, Kashmlr - Bouncing along in a horse-drawn tonga, the visitor nortes the signs on the tiny stalls---Abdul Aziz the Carpet Seller; Samad Shah the house-boat Agent; Ramsana Dubloo, Sightseeing and Hunting Trips. Then, a clearing and a three-story building emblazoned with a sign which momentarily stuns the tourist. It says"Subhana the Worst, Departmental Store." It's a trap and you know it, but it works. At the front door stand three men. Is it your imagination or are they really rubbing their hands with gusto? Instinctively you give your wallet a comforting pat. One member of the three-man welcoming committee identifies himself as M.Subhana Kachroo, five generations descended from the Subhana who started the store in 1840. He kicks off his shoes and ducks under a curtain across the front door, pulling you with him. He leads you across a red carpet to an overstuffed couch. "Throughout the years, Kashmir Valley had been a quiet Summer retreat for a limited number of vacationers.Then during World War II, many soldiers, mostly Americans, came to Kashmir.They had plenty of money. They liked Kashmiri handiwork. "Soon everybody wanted to become an art merchant, carpet merchant, wood-carving merchant or what have you. Even peddlers and boatmen opened shops. They were all 'the best.' An English friend of my father then suggested to him that he should become 'the worst.' Subhana (the fifth) said his father's experiment worked. Today, Subhana employs 460, most of whom work in small factories or in their homes, doing embroidery work, woodwork, weaving, wood carving and furniture making. During the long Winter when Srinagar is isolated by heavy snow, Subhana's workers build up stock for the next season. The tea and cookies are out of the way and now it is time for business.Subhana squats on the floor in front of his customer. Barefoot clerks spread a large sheet on the carpet. At Subhana's command they begin bringing articles from the floor-to-ceiling shelves and the showcases which ring the room. There is a woman's wool evening jacket. "This took one person nine months to embroider," Subhana says. The price: 450 rupees ($94).Then a shawl called shahtoos. Subhana says it is woven from the soft breast of a mountain sheep. This is light as a feather but one of the warmest materials made, Subhana says. Furthermore it hasbeen impossible to obtainsince the Communist Chinese overran the Tibetan mountains where the sheep live. The price of the shawl-7,OOO rupees ($1,470)'. A clerk brings an exquisitely embroidered tablecloth which costs 1,500 rupees ($315). Subhana says it took 2 years to make. The embroidery work is so fine that a worker can sew for no more than an hour at a time without giving his eyes a rest. Most of Subhana's ware are by no means so expensive. He has walnut carvings ranging from $2 upward, copper and brassware at a wide range of prices, and for $2.50 a silver bracelet with such typical Srinagar charms as a houseboat, boatman's paddle and hooka. (water pipe). But a tour of a maze of tiny rooms on the upper floors is necessary to see the thousands of items. "Many of my customers spend two or three days here," Subhana says proudly.Whether Subhana is "the worst" or "the best" could be argued, but Subhana is unquestionably "the most."